A follow-up study to the study in the last post was published just this past month. That previous study was one of the early reports on whole grain and cardiovascular disease. 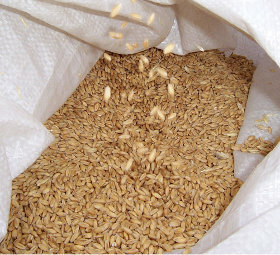 It showed that whole grain consumption lowers cardiovascular deaths. Along with some other early studies, it resulted in the FDA defining “whole grain” and allowing health claims for “whole grain” products. The study in the last post has a link to the entire publication. The link to the recent study (1) is only to the abstract. However the basic findings were the same. The original report was known as the Nurses' Health Study and included over 75,000 participants. The present study included over 74,000 from the Nurses' Health Study and over 43,000 from the Health Professionals Follow-up Study. This resulted in over 118,000 persons being studied for 2,727,006 person-years of follow-up. Similar to the earlier study, the researchers divided the participants into 5 groups according to how much whole grain they ate. They then determined total mortality from all causes, cardiovascular mortality and cancer mortality for each group. As in the prior study a higher whole grain intake was associated with lower total and lower cardiovascular mortality. They corrected the results for the same non-dietary factors that they had in the original study. Age, smoking, body mass index, physical activity, and a modified Alternate Healthy Eating Index were examined for the possibility of influencing the results. There was an improvement in mortality for those eating whole grain products compared to those who did not eat whole grain, even among those who had healthy habits in each of those categories. They also looked for an association of eating whole grain with cancer mortality. Although their statistics showed a mild effect, it was not statistically significant. The researchers concluded that whole grain did not affect cancer deaths. Just like it did in the early study, bran appeared to have a very strong correlation with improved total mortality and improved cardiovascular mortality. It was the component of whole grain that had the strongest effect on mortality. They also considered whether the germ in the grain had an effect. Germ had an improvement in mortality. But after the bran effect was corrected for, the improvement was not significant. This study, like the prior study, used a food frequency questionnaire to determine the eating habits of the participants. So, as discussed in last week's post, this study has the same strengths and weaknesses as the prior study concerning the data used. The difference in fruit and vegetable consumption is another factor that may be influence cardiovascular mortality. Fruit and vegetable consumption is known to reduce the prevalence of cardiovascular disease. A large number of studies have shown this improvement. Also a large number of studies have shown the improvement in heart and vascular health from a high potassium sodium ratio in the diet. Fruits, vegetables, and intact grains (and especially bran) all have high ratios. This high ratio seems to be the common thread in studies concerning diet and cardiovascular disease.